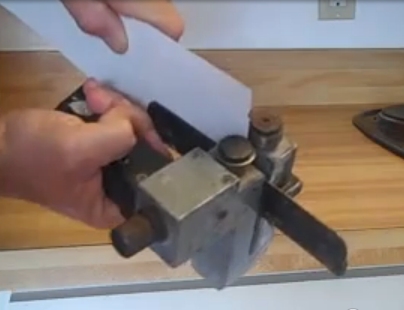 Cutting cabinet Formica into thin strips can be done with this hand-slitter tool. It is by far the best tool for making cabinet edging for doors or face-frames. It is designed to make cuts that are 3/4″ to 3-1/4″ wide. The cutting blades adjust to cut VT and Standard thickness Formica cabinet laminate. Refer to this article: How To Cut Plastic Laminate Strips, for more detailed information.